MDC Contracting, LLC has over 30 years experience in constructing grading projects ranging in size from $10,000 to $4,000,000. Whatever the requirements of your specific project may be, we have the knowledge, experience and resources to complete the work on time and within your budget. Services have included site balancing; utility installation of sanitary sewer, storm sewer, and water main; parking lot construction; and foundation excavation and backfill. Many developers have learned to lean on our extensive background and knowledge in solving challenging site problems. We have completed many commercial projects, including multiple grocery and department stores, as well as numerous subdivisions, condominium projects, restaurants, medical offices and professional buildings. MDC Contracting is one of the most respected and experienced underground contractor in the Northern Michigan area. Having completed projects including small municipal improvements, large waste water treatment plants, and difficult city reconstruction projects, MDC has the knowledge and resources to complete the most challenging of projects in a safe, quality focused and productive manner. As the primary installer of High Density Polyethylene (HDPE) pipe and the one of the few contractors with Electrofusion capabilities north of Traverse City, we are uniquely positioned to put this advanced technology to use for you. Our projects range form using this piping for pumping of toxic lechate water to installing it for sewer services and pump stations for homeowners. We also have extensive dewatering capabilities for pipeline and excavation projects. MDC Contracting offers a variety of concrete products. We carry the full line of Redi-Rock and Rosetta products. Click an icon below to learn more about either product. We are the product developer and exclusive Northern Michigan manufacturer of Redi-Rock segmental retaining wall blocks. Redi-Rock walls are capable of reaching heights up to 20' without geogrid or tiebacks, while maintaining the look of natural stone. OUr block installation crew has installed Redi-Rock walls from small residential walls to 20,000 sqft as well as commercial and industrial walls. We are also the exclusive Northern Michigan manufacturer of Rosetta Hardscapes segmental retaining wall blocks, pavers, and steps. The benefit of Rosetta is simple. Every Rosetta product looks just like natural stone, but is made out of architectural grade concrete with consistent dimensions so that they install as easily as a typical concrete hardscape. Rosetta is an ideal product for backyard landscaping as well as larger landscape projects. MDC Contracting is one of the largest ready-mix concrete suppliers in Northern Michigan. With plants located in the Charlevoix, Petoskey, Gaylord, and East Jordan areas, MDC will provide the best service and quality for any residential, commercial or MDOT project. With our array of trucks, pumps, and four plant locations, we service a large percentage of the concrete crews in Northern Michigan. 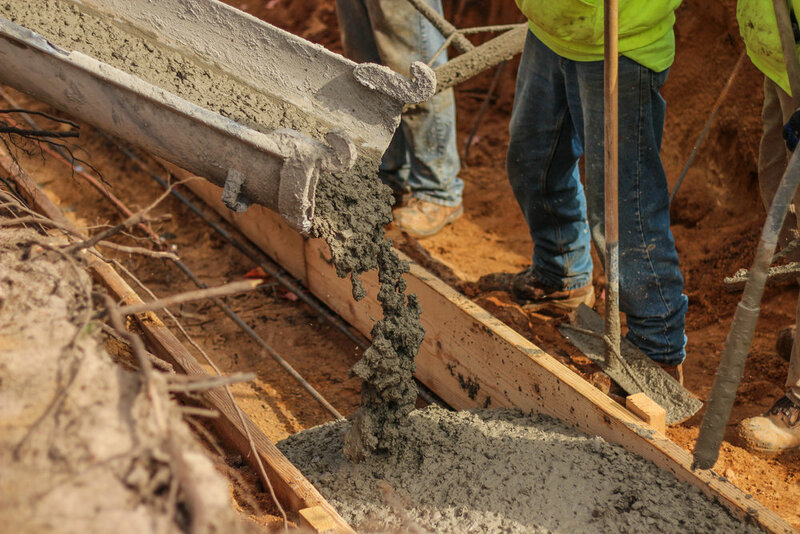 The quantity of concrete we sell has allowed us to develop relationships with all local concrete crews, so we can find the best concrete contractor for your job. With two boom pumps and a line pump in our repertoire, we're equipped for any project! MDC Contracting provides a wide rage of custom aggregates for all types of projects throughout the Northern Michigan area. With crushing, screening and wash plant operations, MDC has the ability to produce custom materials for your project either at your site or at one of their pits in the Northern Michigan area. With two crushing plants, three screening plants, a sand classifier, and one wash plant; MDC is capable of producing most MDOT specification aggregates as well as custom sands, gravels, stone and topsoil to meet almost any application requirements. We have over 35 years of experience in this area with a dedicated staff of experts. Better Business. The Best People. At MDC, you won't just find a job. Deep rooted and hardworking career minded individuals make our community across numerous divisions of opportunity. With site construction, underground pipe laying, trucking, concrete mixing, fabrication of architectural landscape products and all the administration that goes along with it, we have a lot of people to learn from, share expertise and grow with. Do is what we do best with pride, care, safety, quality and production in mind.